This tree, with rough bark, has compound leaves with 5 leaflets, the lower pair are smaller than the other 3, margins smooth, upper leaflets lanceolate to 15 x 8 cm, midrib pale, flat with surface or slightly raised, lepidote scales present. 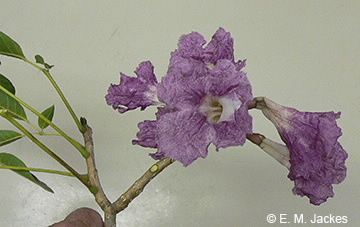 Flowers with a bilabiate pink calyx, lepidote scales obvious; corolla pink, throat whitish. T. pentaphylla is treated as a synonym of this species.